In future, this section will exapnd to include any unique products we think are worth offering to the Australian Robot Building Community. Our First Product is.. Finally, an economical answer for the Australian Bot Builder is here. After many months of R&D, Robowars are happy to offer for sale The IBC..
Everything you need to control your bot all on one compact board. 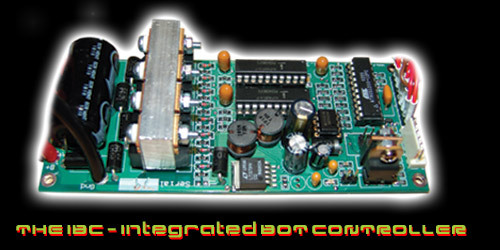 "The Integrated Bot Controller" (IBC) has. Two channels means no need for seperate left & right controllers with the IBC. Combining both sides in one board has allowed us to save space, weight, cables and complexity, and unlike most Fan-Only cooled controllers that have no heatsinks on their Mosfets , the IBC will handle huge power surges wthout destruction thanks to its Hi-Capacity Heatsinks. Perfect for Featherweight, Lightweight, and even some middlweight Robots, the IBC has successfully driven Drill Motors, Compressors, Windscreen Wiper Motors, Golf Buggy Drives and more. Want more than a wedge-bot ? You will need a 3rd Radio Control channel to activate that flipper, spinner or other weapon. The IBC will decode that 3rd channel into *two* relay outputs. One for stick-forward, and one for stick back. Dual Controls are here. How many weapons and arms can you think of for you bot with this feature ? Have you tried to drive your 'bot when its upside down ? Confusing isnt it ? Everything is backwards to what you are used to. With the IBC, just flip a switch on your control (uses 3rd RC Channel), and your controls are back to normal ! Or connect the FLIP to a tilt-switch and have the bot automatically sense which way up it is and adjust itself ! Nearly all other controllers out there require at least 10 volts input to keep them working. Any less and everything stops. Thats OK if you are running 24v or more worth of batteries. But that isnt always possible in lightweight designs. Or if your batteries voltage drops a little under the load. But with the IBC, there's no need to worry, the switching voltage regulator design will keep the circuitry ticking no matter what. No sudden microprocessor halts as the main batteries voltage fades under load. Built-in FAILSAFE function. Pass any Radio control safety test first time. Built in BATTERY ELIMINATOR Circuit. - Eliminate that Radio Reciver Battery ! Do you know how many fights have been lost (and RC Airplanes crashed) due to a failed, flat or just plain "forgot-to-turn it on" receiver battery ? Its even happened to World Battlebot Champions. 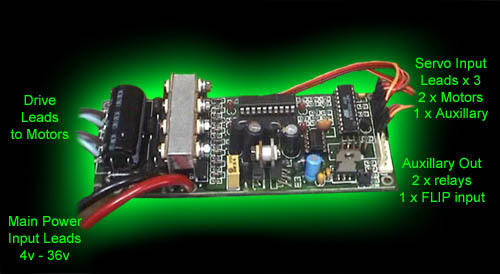 With the IBC's Battery elimintor circuit, your receiver can be powered from your controller. Through the same switching regulator design that makes the IBC low-voltage proof, your receiver will never "Go Deaf" from a bad Rx battery on you. Designed by a Melbourne based Electronic Engineer with over 15 years of experience, local technical support available, no phone calls or shipping to/from the UK or US, No Import Duties to pay. This is why the IBC is such good value for money. ALL IN ONE DESIGN - Simple to connect and use. No complex programming or configuration required, just plug it in and drive away. COMPACT SIZE - Just 130mm wide x 55mm High x 30mm thick. Extensive use of Surface Mount components and careful PCB layout has allowed us to pack this controller into the smallest possible size for its functionality. See if you can find another controller with equivalent capabilities this small. Just what you need to have maximum space inside your bot for everything else. UK: The IBC is now available in the UK through Featherweights.org. International Shipping, The strong Australian dollar and the import taxes have combined to make them moderately expensive in the UK, but there is nothing we can do about that. Keep in mind when comparing their prices to our Australian price that all these additionals will be added even if you purchase directly from us, so you are probably better off going through them. The IBC Manual is available for download. RoboWars is also working on producing 200 Amp and 400 Amp controllers for the bigger bots. These should be available later this year. See the controller-guides page for more information.